What could be easier than preparing and baking a pan of buttermilk yeast rolls in about an hour and a half? They're light and tender - simply delicious! Have all ingredients at room temperature. Place ingredients in pan in the order listed. Select dough/ manual cycle. Do not use the delay timer. Check dough consistency after 5 minutes of kneading. The dough should be in a soft, tacky ball. If it is dry and stiff, add water, ½ to 1 tablespoon at a time. If it is too wet and sticky, add 1 tablespoon of flour at a time. At end of cycle, remove dough; follow shaping and baking instructions below. See our Bread Machine section for more helpful tips and information. Hand-Held Mixer Method: Combine yeast, 1 cup flour, and other dry ingredients in mixing bowl; set aside. Combine water, buttermilk and oil; heat to 120 to 130ºF. Add warm liquids to mixing bowl, mix on low speed to combine. Beat 2 to 3 minutes on medium speed. By hand, stir in enough remaining flour to make a soft dough. Knead on floured surface until smooth, about 2 minutes. Stand Mixer Method: Combine yeast, 1 cup flour, and other dry ingredients in mixer bowl fitted with a paddle attachment; set aside. Combine water, buttermilk and oil; heat to 120 to 130ºF. Add warm liquids to mixer bowl, mix on low speed to combine.Mix for 4 minutes on medium speed. Switch to dough hook and gradually add remaining flour and knead with dough hook for 5 minutes until dough is smooth and elastic. Food ProcessorMethod: Have all ingredients at room temperature. Add 1 cup flour and all other dry ingredients to processing bowl with steel blade. While motor is running, add liquid ingredients. Process until mixed. Continue processing, adding remaining flour until dough forms a ball. Place dough in lightly oiled bowl and turn to grease top and cover the bowl. Turn on oven to lowest setting for 1 minute, then turn it OFF. Place dough in oven to rise for 15 minutes. Press dough evenly into greased 9-inch square cake pan. Sprinkle top of dough lightly with flour. With sharp knife, cut dough into 12 rolls, cutting almost to bottom of pan. Cover; let rise in warm place until indentation remains after touching. Bake in preheated 400º F oven for 15 to 20 minutes until golden brown. Remove from pan. Break apart into rolls; serve warm. I make a lot of different rolls, but I can say this will be one of my favorites. My buttermilk was not at room temp, but they still turned out great. I made the dough in my bread machine and then followed directions. Please use bread flour for this recipe to make it come out great. I made these in a round pan since I didn’t have a square pan. The rolls turned out well and tasted like dinner rolls should. But, the middle of the loaf deflated, did I do something wrong? I’m glad you enjoyed the rolls! Did the rolls rise before baking, and collapse during baking? When a dough rises okay, but then falls, it is a sign of weakness in the dough. It could be related to the strength of the flour. Let me explain. The dough is like a balloon. The yeast produces the leavening (like the air to blow up the balloon). The dough must trap the leavening in order to expand. Sometimes, as the dough expands, it can become too weak to continue to trap the leavening being produced by the yeast. The yeast does not stop working until it is ‘killed’ in the heat of the oven, but if the dough becomes weak, as the yeast continues to produce the leavening, the dough gives up and collapses. (like a balloon that deflates as its sidewalls begin to weaken and lose their integrity. If you’re not already doing so, always use bread flour as opposed to all-purpose flour. For yeast-raised doughs, we recommend bread flour. Bread flour is a consistently stronger flour with superior dough forming and rising properties. All-purpose flour can vary in terms of strength. This does not make all-purpose flour bad by any means. It is great for cakes, cookies, pie crusts, quick breads, etc, but it is not ideal for yeast breads. I hope you will find this information helpful! If one is doubling this recipe, should the yeast be doubled? Yes, use 2 packages, or 4 1/2 tsp of yeast when this recipe is doubled. Let us know how the rolls turn out! These are not my traditional Holiday rolls, which are the ones my grandmother taught my mom to make. My family, even my picky husband, loves them!They are not as time consuming as what I’m used to. The worst comment I got is that they are a little dense-but it’s not a bad dense. I’m thinking of making baked sandwiches with leftover Christmas ham, using this recipe in place of the Hawaiian Rolls. I believe we have a new tradition. well, i am trying them cold turkey for this thanksgiving. These are the best and easiest rolls to make. I whip them up for lunch and have them with soup. They always turn out fluffy with a beautiful taste. I found this recipe on the back of a packet of Red Star. I made two batches of these ahead of time for Thanksgiving snd froze them. They truned out great and the bread machine made it easy. I’m about to make them again for a Christmas party. It’s a keeper! I made these rolls. They taste good, the dough is beautiful and great to work with. My rolls collapsed while cooling though. I am wondering what caused this so I don’t make the same mistake twice. I do not have a “regular” oven, so had the dough rising in a warm, draft free place for about an hour. Did they rise too long? Does anyone know? Thank you! Just tried this recipe for the first time after reading the reviews I have to agree these are the best tasting roll I have ever made or taste nice and buttery and soft just taste one and drinking it with a hot cup of cappuccino going for a second one this will be my go to recipe. We have a function at work coming up and I will definitely be making these.Thanks Red Star. 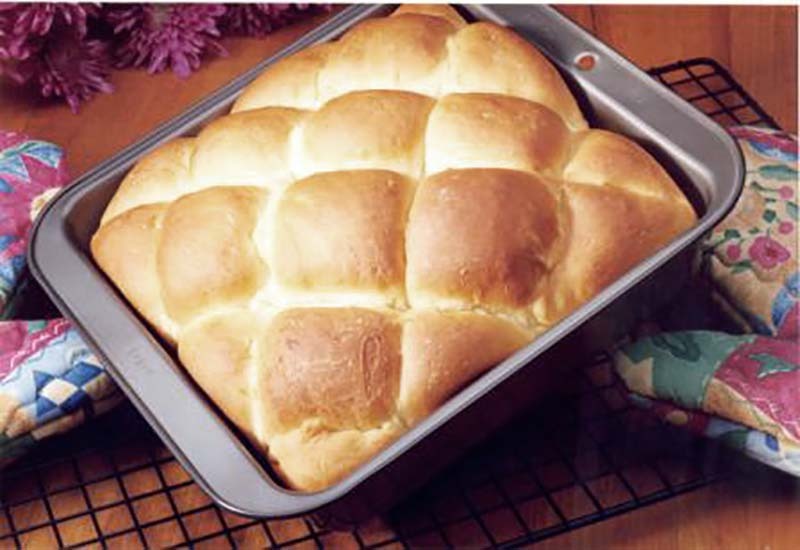 I was intimidated of yeast rolls, but these are easy and yummy! I can bake bread.. 🙂 yippee!!! I just made this recipe using my stand mixer and it came out great! Thanks so much for this easy recipe. I tried these because they sounded pretty simple to make and I didnt have a bread machine. My husband loved them and has asked me to make again and again. They taste so good! I love how you put them in the oven to start the rising process then take them out and then bake for 15 – 20 min and presto they are done! Awesome recipe and kudos to Redstar Yeast for helping me learn how to do homeade bread the easy way! This is the best recipe for dinner rolls I have ever made! I love to make yeast breads often but I’m always wishing for something better. I had my doubts because this recipe is so very very simple! But now I think this may become my go to recipe for fast easy and delicious bread for dinner!! I would like to let everyone know that these rolls are as easy as they sound and they taste FANTASTIC. I love the shaping technique…I’ve never seen this before and it worked great.